Theory and Background — Pond Engineering Laboratories, Inc. Temperatures on the ITS-90 are defined in terms of equilibrium phase states of pure substances. Pure material would produce absolutely accurate resistance readings through an induced phase conversion: melting or freezing, or at Triple Point (all three phases in equilibrium). Ideal Container for "Pure Stuff"
An indefinitely durable, non-contaminating, sealed environment made of stable, impermeable material maintains the absolute integrity of the "pure stuff". 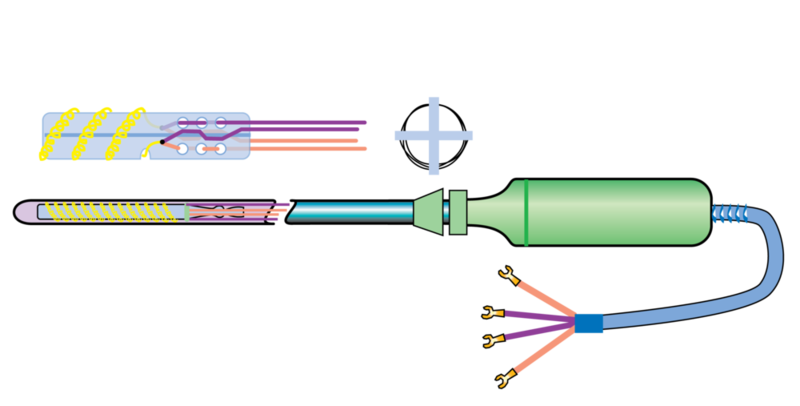 Ideal Thermowell into "Pure Stuff"
transmission eliminates gradients between the "pure stuff" and the environment outside the cell. None of these realization ideals exist in the physical world. However, high-purity materials, innovatively painstaking design, and meticulous fabrication can approximate the conditions of Defining Fixed Point phase equilibrium. Uncertainty is a measure of this approximation - how close the practical comes to the ideal. It is measured by the distance, in miliKelvin, between the temperature in the fabricated environment and the temperature at the theoretical Defining Fixed Point. The resistive element is a high-purity, strain-free platinum coil. Standards of purity set for the ITS-90 require the element to produce a slope of greater than .003986 K-1 at the Triple Point of Water. The high-purity platinum element is placed onto/into an electrically insulating support framework, connected to the four lead wires, and sealed inside a protective quartz glass envelope. The stability of the instrument at the Triple Point of Water is an indication of the degree to which the element is supported strain-free on the framework. Deviation from the theoretical ideal is noted in calibration coefficient equations as delta W (ΔW).